The Travel Information Council (TIC), schedules regular quarterly meetings. You will find information about those, as well as executive and subcommittee meetings on this page. Minutes are posted to this site following final approval. In addition, the following agency meetings and minutes are found here: Oregon Heritage Tree Committee and Oregon Historical Marker Committee. Minutes are located below the calendar for upcoming TIC meetings. Meetings are held quarterly and locations vary. The meeting dates will be posted on this page as they are scheduled. For more information on agenda items, copies of meeting materials, or public access to meetings, contact us. To learn more about the Council, its members and mission, visit the Council web page. Council meetings are sometimes scheduled in anticipation of agency issues which may affect the public and/or require a quorum presence. In such instances, you will find meeting announcements and/or accompanying documents in this section which have not yet been posted to the Department of Administrative Services website (but are in process to be posted). Documents are discussed and may be voted upon at meetings. For questions pertaining to these documents, please contact our administrative office, or telephone us at 503-373-4508. 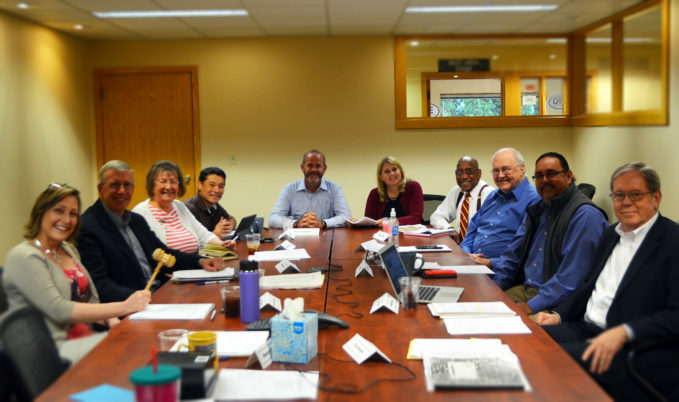 April 2, 2019: The Council will hold a special telephonic meeting on Tuesday, April 2, 2019 at 10:30 a.m. at TIC Administrative Office, 1500 Liberty St SE, Suite 150, Salem, Oregon 97302. The meeting agenda will include approval of the annual review of the Executive Director. June 10, 2019: The Council will meet on Monday, June 10, 2019 at 9:30 a.m. at TIC Administrative Office, 1500 Liberty St SE, Suite 150, Salem, Oregon 97302 The meeting agenda will include committee reports, general agency operations and oversight issues, possible discussion and vote on agency contracts requiring Council approval. For more information, please contact Jessica Carbone at 503-373-0155 or by email. April 2, 2019: The Executive Committee will meet on Tuesday, April 2, 2019 at 8:00 a.m. at the TIC Administrative Office, 1500 Liberty St SE, Suite 150, Salem, Oregon 97302. The meeting agenda will include discussing the annual Evaluation of the Executive Director. Executive Session of the Executive Committee, pursuant to ORS 190.660 (2)(i), regarding review and evaluation of the employment-related performance of the chief executive officer of the any public body, a public officer, employee or staff member who does not request an open hearing. April 18, 2019: The Rest Area Subcommittee will meet on Thursday, April 18, 2019 at 10:00 a.m. at the TIC Administrative Office, 1500 Liberty St SE, Suite 150, Salem, Oregon 97302. Regular agenda items include review of the agency’s rest area operations and recommendations to the full Council on rest area-related matters. While the attendance of the members at the committee meeting may constitute a quorum of the full Council, no actions binding on the TIC will be taken by the committee and all matters that require TIC actions will be brought before the full Council. For more information or for telephonic access, contact Jessica Carbone by telephone at 503-373-0155 or by email . March 27, 2019: The TIC Finance Committee will meet at 2:30 p.m. on Wednesday, March 27, 2019 at the at the TIC Administrative Office, 1500 Liberty St SE, Suite 150, Salem, Oregon 97302. Regular agenda items include review of the agency’s monthly financial reports and recommendations to the full Council on approved expenditures and contracts. The TIC Heritage Tree Committee meets quarterly each year in January, April, July and October (unless otherwise specified). April 5, 2019: The Oregon Heritage Tree Committee will meet on Friday, April 5, 2019 at the TIC Administrative Office, 1500 Liberty St SE, Suite 150, Salem, Oregon 97302. Agenda items include reviewing and making recommendations for new and existing heritage trees. For more information, email Annie von Domitz or telephone 503-373-0864. For more information, email Annie von Domitz or telephone 503-373-0864. May 14, 2019: The TIC Historical Marker Committee will meet at 1:00 p.m. on Tuesday, May 14, 2019 at the TIC Administrative Office, 1500 Liberty St SE, Suite 150, Salem, Oregon 97302. Agenda items include reviewing and making recommendations for new and existing historical markers. For more information, email Annie von Domitz or telephone 503-373-0864. The calendar below displays statewide agency meeting announcements and documents. You may click on the calendar to view the current or upcoming months. If you need assistance using the transparency website, please contact us. Minutes are listed by most recently approved. Oregon Travel Experience administers the Oregon Heritage Tree Program. Committee meetings are held quarterly or coincide with tree dedications at various locations around the state. Be sure to visit the Heritage Tree Program pages on our site. Oregon Travel Experience is the administrator for the Oregon Historical Marker Program. Committee meetings are held quarterly or coincide with marker dedications at locations across the state. Discover more about the program on our Historical Marker pages. Need Adobe Reader? Download the application free of charge.